Spicy orange chicken for one. Ideas of what you want to can get stuck in your head until you actually cook what your brain won’t let go of. 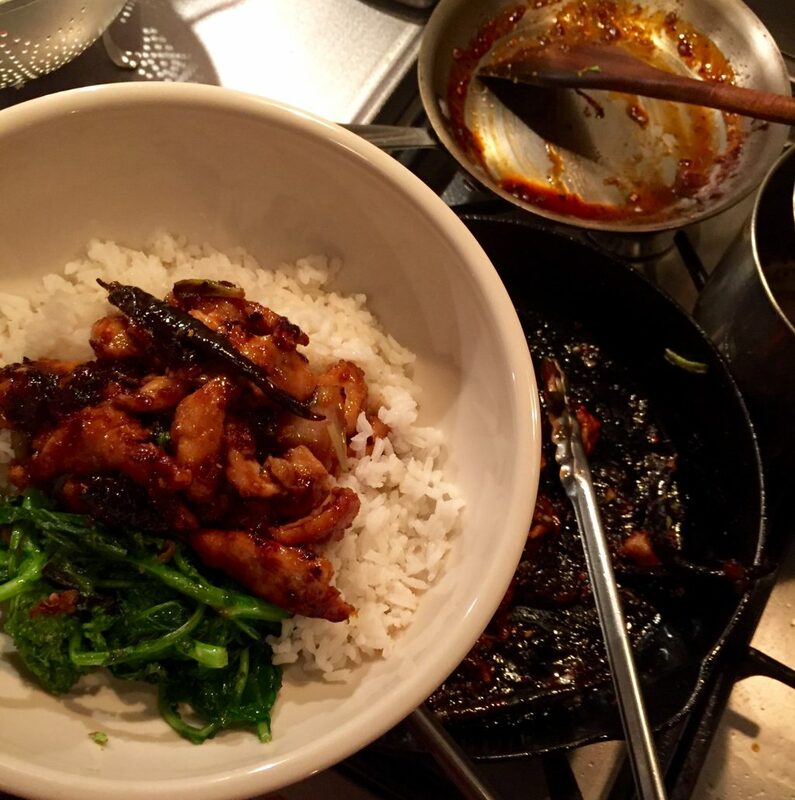 This happened last week when I chanced on a recipe for spicy orange beef in The NYTimes cooking newsletter. I love this dish and often order it when I see it, and I’ve made variations throughout the years. But having the second half of an excellent chicken breast from butcherbox (boneless but happily with the skin left on), I decided that spicy orange would work with chicken perfectly well. And so it did, in under 30 minutes in a tiny Manhattan kitchen. It’s all about the sauce, but coating and frying the meat is also important for flavor and texture. I didn’t have any cornstarch on hand so used flour in the egg white, which was adequate, but flour has gluten which gives it a softer bite compared with the crisp crunch of a pure starch. I used rice vinegar but I’d have used lime juice had I had it. If I don’t give quantities, it means it’s to-your-liking or what-you-happen-to-have-on-hand. Combine orange juice, soy, vinegar or lime juice, sugar, hoisin, and fish sauce and stir well. Put the oil in a small sauce pan over medium high heat, then add the garlic, ginger and chilli flakes. Cook till softened. Add the sauce and simmer till reduced by about one-third. Combine the chicken and egg white mixture. In a skillet or wok over high, add the oil. When it’s rippling hot, lay the chicken in and cook till crisp, careful to keep each piece from sticking to others. Remove to a paper towel lined plate. Pour off all but a couple of tablespoons of oil. Return it to the heat and add the chillis, cooking them till they’re black, about a minute. Add the garlic, ginger and half the scallions. Stir-fry till softened, another minute or so. Add the sauce and, when the sauce has come to a simmer, the chicken. Toss till well coated. Remove from the heat add the orange zest, stir, then serve, garnishing with the remaining scallion. Serve with white rice and broccoli rapini blanched and stir-fried with garlic. My past posts on Chicken Romano, NYT Food Conference, and Rip’s Tarragon Butter Baste. A few new Chinese cookbooks that you should have in your kitchen library are All Under Heaven and Phoenix Claws and Jade Trees. What exactly is fish sauce? Serious Eats shares some insight on this salty unami driven sauce. Meet the first street vendor who has earned a Michelin star. This looks amazing! How much oil is needed for frying? Is this a deep fry or pan fry? Also, sorry to hear about your divorce. I hope this doesn’t mean Cleveland has lost you forever! Best to deep-fry, but I wanted to keep it easier so I pan-fried in 1/4 inch oil. worked fine. Let me know how it turns out, bet it’s great! You’ll have a great book out of this. I magically have everything on hand for this… thanks for dinner inspiration!! I will be having this in a few hours. I had shrimp on hand and coated with cornstarch, then deep-fried. I was blown away! You never fail to inspire! Thank you. shrimp works great that way. Looks great! If I don’t have an orange handy, can I just use juice? If so, how much? Wish you would do a General Tso chicken but going to make your spicy orange chicken . Have always wanted to do this. Same technique, just a little more sweet and sour. Have never found a recipe I liked. This was a delicious recipe! Thank you for a great dinner last night. LOL! I made it with lime juice and I pan fried it in about 1/2 inch oil and I thought that it was oh so tasty and quite crispy. Please keep blogging and posting. You are very much appreciated by so many readers and fans. Made this tonight. My husband and I loved it. It’s a keeper. I’ll be making it again. Your recipes never disappoint! Thanks all who made and commented. I hope you’d tell me if any of the ingredients seemed off. Glad you are back. Look forward to your posts and trying new things in my kitchen. I made this last night with shredded chicken (a by-product of making stock) instead of strips and it was delicious. The Aviation needs a repost, tweeked. Having one now with the Seattle cherries and a little juice, pre clam linguine dinner. Goddam good! Gosh, it’s nice that you are back! Funny, I am catching up with your blog and just read again ‘Tender is the Night’. Painful and beautiful. I hope that it helps in some small measure to know that people care. Cooking is like a meditation to me..solace, perhaps.